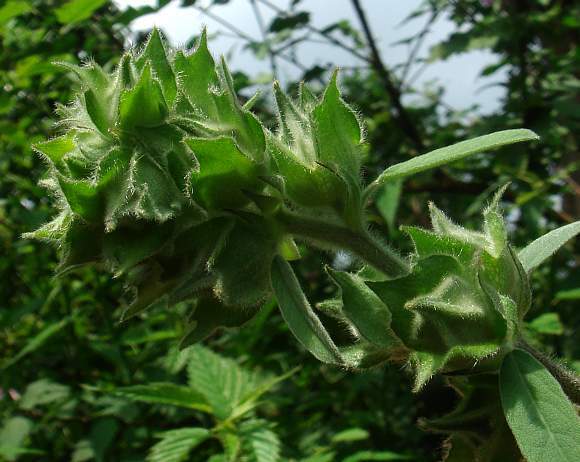 A shrub which grows up to 2.5m high, usually in gardens, but it can escape when discarded on waste lands. 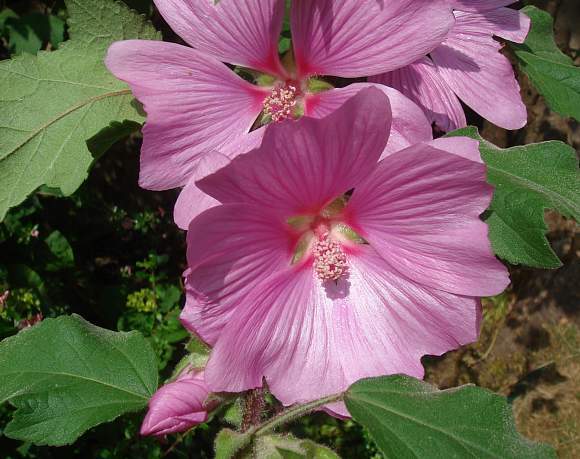 Unlike Tree Mallow it has leaves that are only 3 to 5 lobed (rather than 5 - 7 lobed) and which have a long central lobe (unlike Tree Mallow which has palmate leaves). A young developing branch yet to become flowers and leaves. 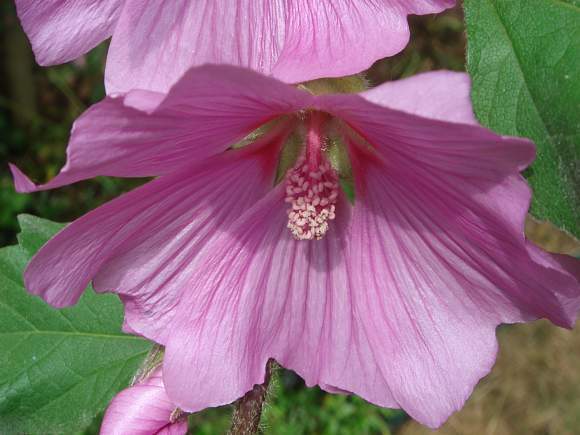 Unlike Tree Mallow the flowers are larger with petals that are 15-30mm long (rather than 14-20mm long). They are also either pale pink (as here) or purple and completely lack any large central dark purple to indigo splodge with stripes. The flowers are bisexual but this one is only showing the many anthers. The anthers and pollen grains. 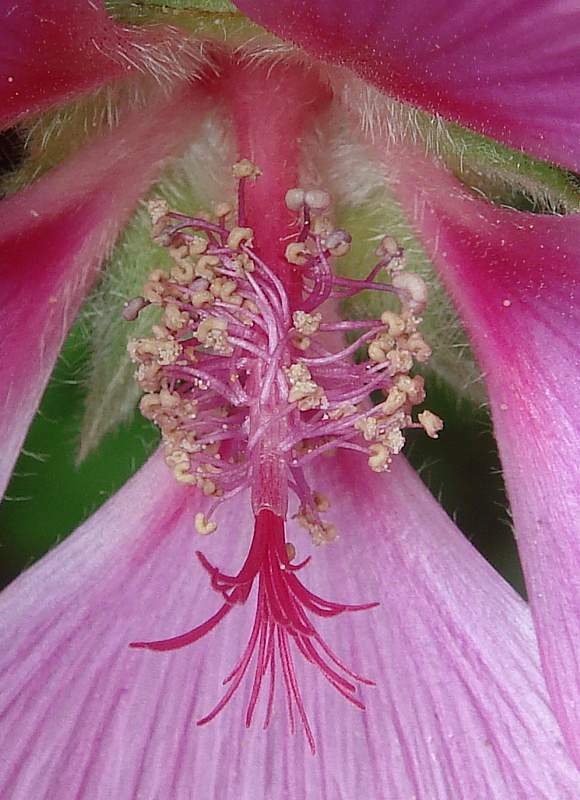 This flower admirably demonstrates the strange arrangement of male and female parts: the reddish style emerges from the tip of a long translucent tube or sheath and splays out into numerous stigmas. Meanwhile the numerous filaments are pink and peel away from the central tube at intervals, each with a cream-coloured anther at the tip. 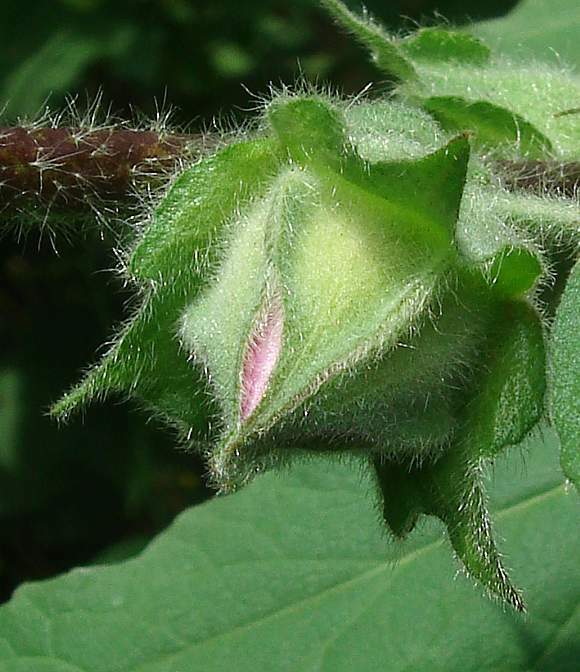 An un-opened flower-bud still wrapped up by an outer set of green, hairy triangular things being the epicalyx and an inner set being the calyx. 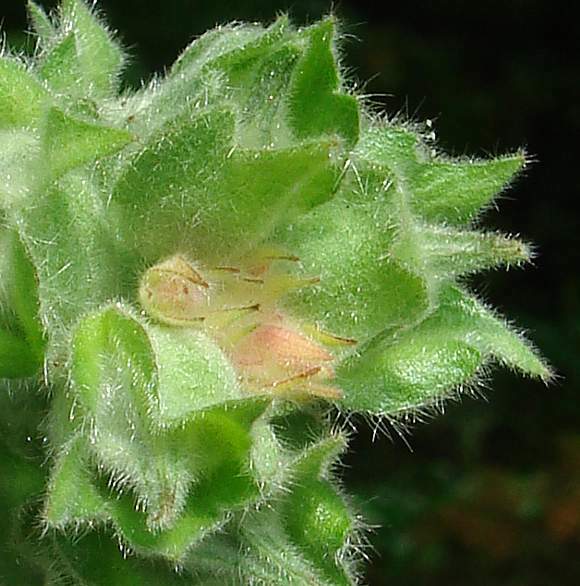 The flower inside grows longer and pushes apart the inner sepals. 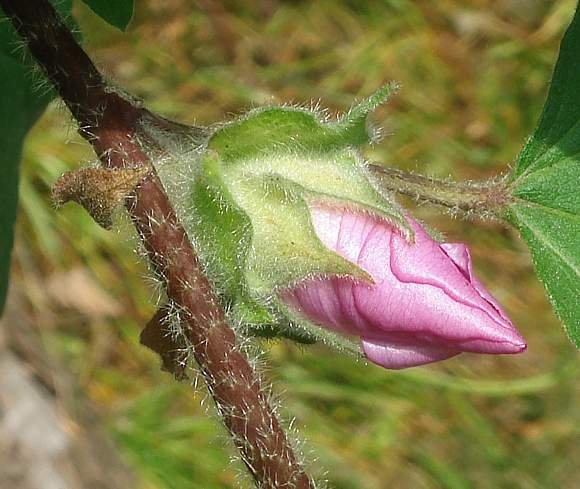 The petals are rolled up into a cone, but will unfurl to make an actinomorphic flower. A typical leaf, with 3 lobes (sometimes 5) the central lobe being long. 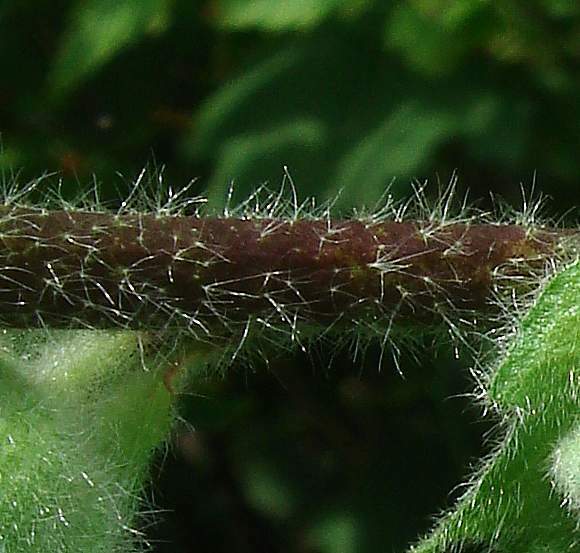 Underside of leaf is shortly hairy. 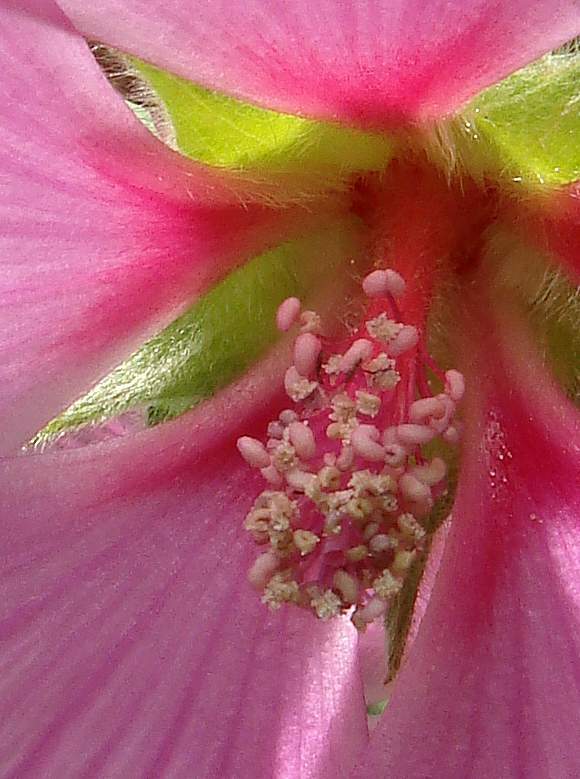 The younger stems, like those of Tree Mallow and Lesser Tree-Mallow , have some hairs that are stellate: star like - they branch (at the base) into several, like a star. 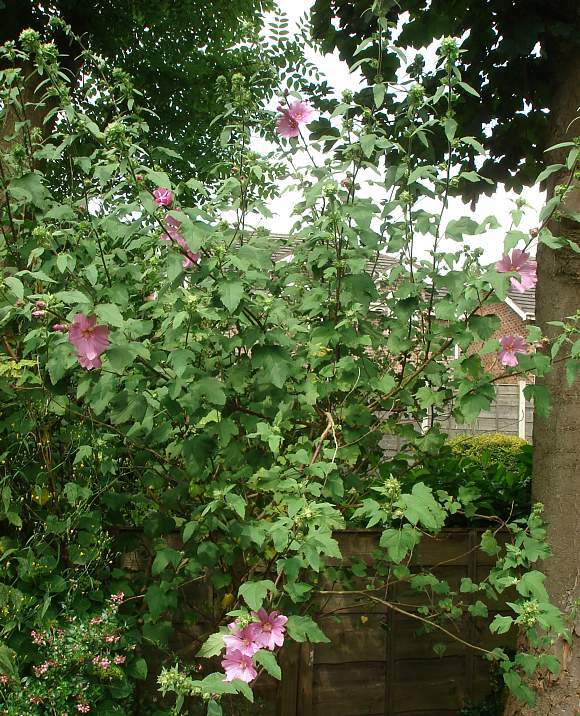 Your Authors Garden Tree-Mallow shown in the above photos only lasted 3 or 4 seasons before dying. Easily mistaken for : Tree Mallow (Malva arborea), a biennial or perennial shrub with pink (or purple) flowers which have a central indigo splodge with outward streaks, where the petals have little or no gaps between them and which grows slightly taller at 3m and only likes to grow near the sea, usually quite close to it, although it can be found inland and there might be mistaken for Garden Tree-Mallow. 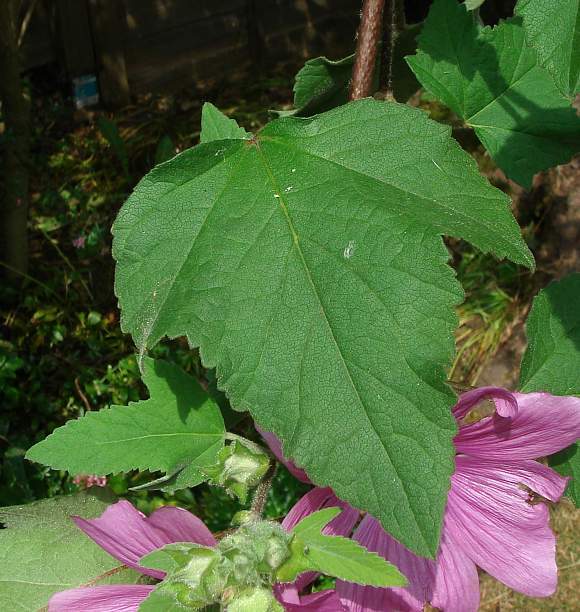 The leaves of Tree Mallow are 5 to 7-lobed and palmate whereas those of Garden Tree-Mallow are only 3 to 5-lobed, with the central lobe extended. 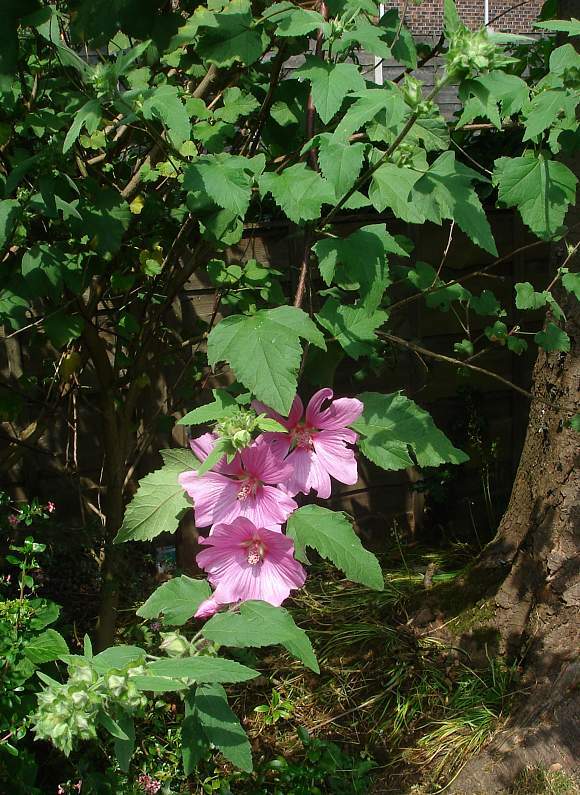 Some similarities to : Lesser Tree-mallow (Malva pseudolavatera) but that has paler petals that are lilac and which, like Tree Mallow also inhabits rough ground near the sea (unlike Garden Tree-Mallow which avoids the coast). 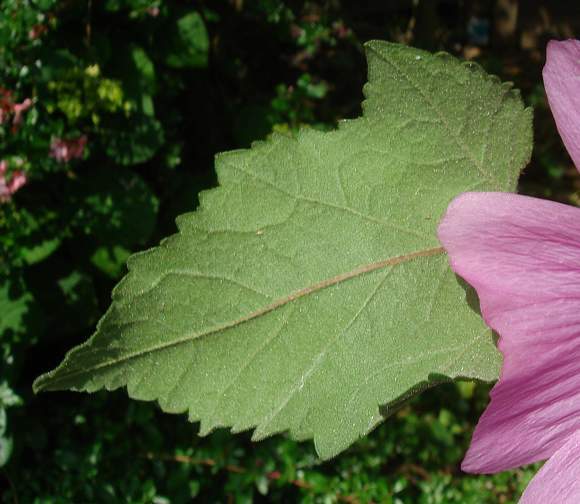 Lesser Tree-mallow is a lot rarer occurring in the Scilly and Channel Islands.